It's that time of year. Baseball season! Oh, not that? Tax time. Yay! 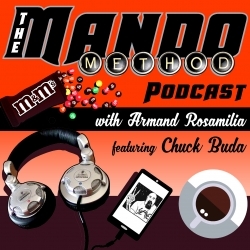 The Mando Method Podcast co-hosts Armand Rosamilia and Chuck Buda talk about what they do with the money they get from writing and how much they fork over as the Tax Man Cometh. Yep, another episode The Mando method Podcast co-hosts Armand Rosamilia and Chuck Buda dive into one of the many questions posed to us by loyal listeners. Did we answer your question this time around? Did you even bother to send us a question? Call it by any name and it's still The Mando Method Podcast co-hosts Armand Rosamilia and Chuck Buda talking for an hour and you trying to figure out what we're saying and why we're even saying it. Was your question answered? Tune in to find out. The Mando Method Podcast: Episode 79 - Why Do We Write? A question mankind has asked for five hundred and sixty-seven billion years. Why did the caveman write poetry while riding dinosaurs given to us by the ancient aliens?